Care for a dry picnic? 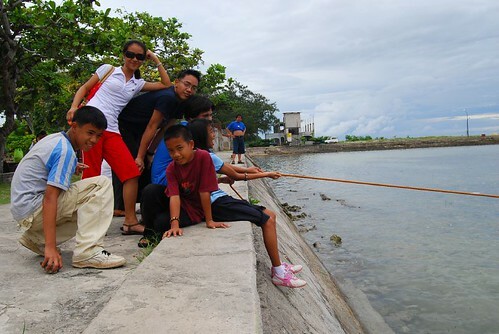 We had one at the Baclayon Park or Baywalk. The decision was made at the spur of the moment after a short visit to the massive and oldest church in Bohol, the Baclayon Church. 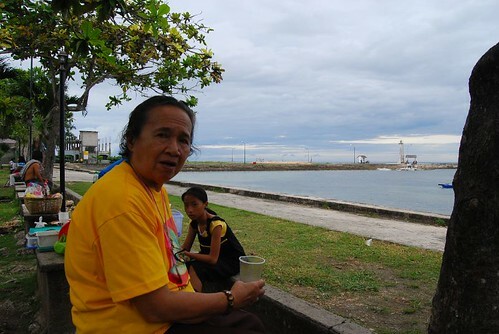 The park is just across the street of the stone church and one can enjoy the cool sea breeze and a stunning view of the sea. One can also choose to face the church and the school premises and watch the different kinds of transportation that passes by. It is interesting to see foreigners, slit or round-eyed, dark or white-skinned stopping by the church for a visit. 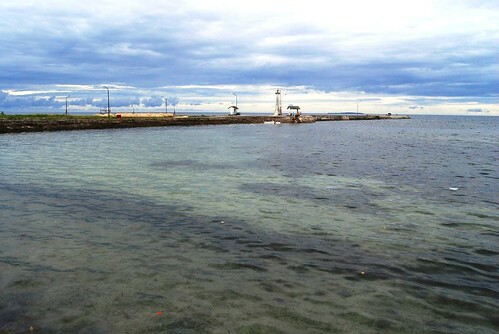 The town’s pier or wharf can be seen, stretching out towards the deep. Many outrigger boats dock at the wharf waiting for tourists who wants to go to Pamilacan Island where the dolphins and whale-sharks abound. Looking out to the sea, and on the right-hand side are mangroves. Some of the trees were old and the others just newly planted. 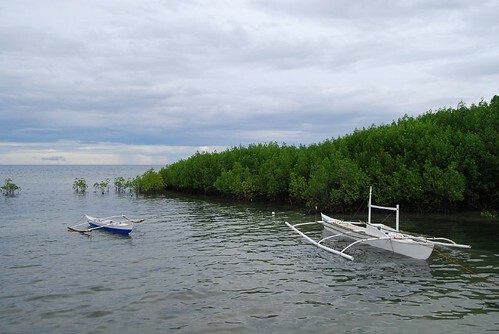 The mangroves have small branches that stretch outwards with small, oblong leaves. The roots are the main attraction. There are many and they curve out towards the seabed, interlocking together, creating a strong hold on the seabed. I can see why the Boholanos are encouraged to plant more mangroves. They serve as a strong barrier to waves and prevent erosion of land along the shore. Likewise it serves as a habitat for small mammals and crustaceans. We saw many small crabs crawling upon the roots, red and black ones and plenty of small fishes darting in and out of the labyrinth of roots. I thought crabs will turn red after cooking, yet I saw plenty of tiny red crabs which are very much alive, climbing the roots. The park is provided with stone seats and we chose one where we laid down our “baon” or food. We had adobong manok, pansit, humbang baboy, and bottles of Coca-Cola. Our group was made out of two families, and pitching in, we have more than enough food to last the whole day. The kids chose to sit down on the stone wall and, with feet hanging down, gulped down their food in an instant! We oldies took to the stone seats and comfortably ate our share at an unhurried pace. It is really nice to have lunch outside with fresh air blowing thru your hair and a lovely view, once in a while. It surely adds up to a good and hearty appetite! Beside the park is a tennis court. So if you care to visit Baclayon and try a dry picnic, you may bring along tennis rackets and balls and enjoy a brisk game or two and sweat out! The Municipal Hall of Baclayon is just beside the tennis court and across it, the town market. Our trip was blessed with a sunny day and out in the open, we enjoyed our short stint at the Baclayon Park. 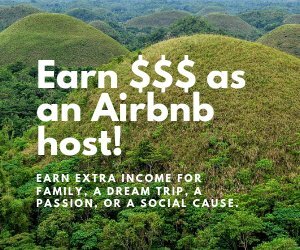 Why not try it? A visit to Baclayon Church is a must for first timers and a dry picnic afterwards is a bonus. Relaxed and happy, you will enjoy your tour the more and appreciate the countless gifts that God has poured out on this little island of Bohol! Baclayon Tourist Attraction - The Municipality of Baclayon has several attractions, mostly heritage edifices such as the Baclayon Church of Our Lady of the Immaculate Conception, the Baclayon Museum, and the Heritage or Ancestral Houses. 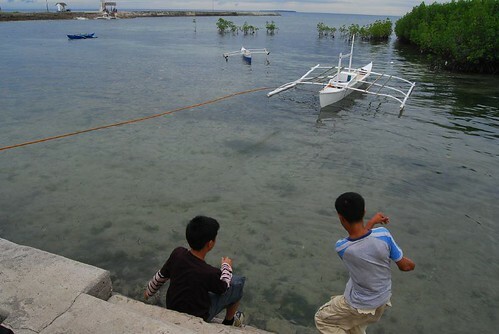 It has a special attraction though, the Pamilacan Island, where one can enjoy watching dolphins and whales at play. Baclayon Church - The Church of Immaculada Concepcion in Baclayon is considered to be one of the oldest in the Philippines. Construction began in 1717 where some 200 native forced laborers (obras pias) cut and dragged coral blocks from the sea, using only bamboos in moving and lifting the stones in position. 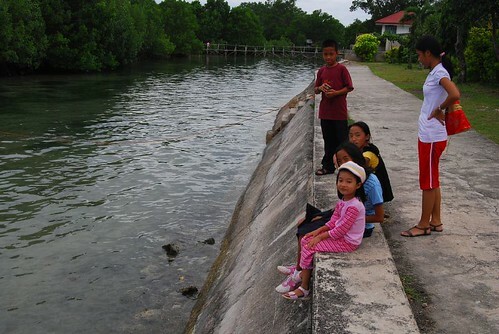 Picnic at Baclayon Park - Stop and enjoy a picnic at the bayside of Baclayon. With the church in the background contemplate the blue green sea while finishing off your adobo chicken!